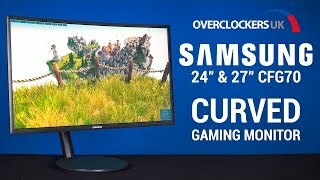 The Samsung C24FG70 (C24FG70FQ alternative designation) and C27FG70 (C27FG70FQ alternative designation) are new 23.5” and 27? members of the CFG70 series, boasting curved 144Hz VA panels. The curve is relatively steep at 1800R, which is the same as that seen on the likes of the C27F591FD and should help a little extra depth to the experience without feeling unnatural. Samsung suggests that it should be more comfortable on the eyes due to the more uniform viewing distance of the screen edges compared to a flat screen. Aside from the curve, the housing itself is a brushed matte black plastic affair which looks fairly understated compared to many gaming monitors. That is something that many will find appealing. The OSD (On Screen Display) is controlled by a joystick (JOG button) with additional pressable shortcut key buttons found on the underside of the bottom bezel, towards the right. These controls allow access to the new ‘Gaming UX’ interface, which is a new revamped and fairly flashy-looking system found on this model. The panels used are 23.5” and 27? SVA (‘Super’ Vertical Alignment) models with a 1920 x 1080 (Full HD) resolution, 144Hz refresh rate and support for Adaptive-Sync (and hence AMD FreeSync on compatible GPUs). The variable refresh rate range is 70 – 144Hz via DP and 62 – 119Hz via HDMI. According to AMD, LFC (Low Frame Rate Compensation) is also supported which tackles tearing and stuttering even below the hardware floor of operation. The maximum frame rate is not 2.5x but closer to 2x the minimum, so if this is the case AMD must have changed the initial 2.5x requirement to 2x. A 3000:1 static contrast is supported, 178°/178° viewing angles are specified and a light matte screen surface is employed. 8-bit colour is supported, likely without dithering. Another key aspect of the specification which Samsung has been keen to highlight is the 125% sRGB colour gamut, which is achieved using a flicker-free Quantum Dot backlight solution. This is a bit wider than the 119% sRGB gamut seen on the S27F591FD but is still not a wide gamut in the sense of reaching Adobe RGB or any extended gamut like that. It’s essentially designed to add a bit of extra vibrancy without heavy oversaturation. Samsung rather brazenly tout a 1ms grey to grey response time on these models, which given the panel type to be approached with particular caution. The monitors include a strobe backlight mode to reduce motion blur as much as possible, called ‘impulsive scanning’. ‘Low Blue Light’ settings also feature, including the Eye Saver Mode seen on some other recent produvts from the manufacturer. From the rear you can see the nifty arm-style stand which allows enhanced adjustability of the monitor. You can adjust the height, tilt the screen, swivel it and pivot it into portrait. Around the stand attachment point (which doesn’t look like it supports VESA mounting) there is a ‘sound interactive’ LED ring. This apparently pulses in time with the sound being played by the system, for example during gameplay. Hopefully this has some static settings as well so it can be used as a sort of bias light. The material used at the rear is again a matte black plastic. There is a K-slot towards the bottom right and some backwards-facing ports; 2 HDMI ports, DP 1.2a and a 3.5mm headphone jack. FreeSync is supported by both HDMI and DP 1.2, but given that it’s likely HDMI 1.4a is used you’ll probably need to use DisplayPort for the full refresh rate range. More links for "C27FG70 27" 1920x1080 VA FREESYNC 144Hz Gaming Quantum DOT Widescreen Monitor"
The best monitor I had, I did not even calibrate the colors because the factory is excellent. Easy to use menu controlled by a mini joystick on the back. Perfect for FullHD, before I had a 24-inch monitor but it's better and you can not see any pixels. 1. Great gaming monitor that allows you save 3x preset configs that you activate by pressing a button on the monitor. 2. sRGB mode is excellent (I do a lot of photoshop), colours are great. 3. Freesync works flawlessly with with R390. 4. Position adjustment is effortless. 5. It's big whilst keeping the 16:9 layout. 6. Once you understand the setup toggle behind the screen (bottom right), changing settings is simple. 1. Screen text isn't as crisp as I've seen on other monitors. Why I chose this? I wanted the colour reproduction you get on an IPS, with the gaming speed of a TN. Only the text is letting this otherwise great monitor get a 10/10.